Adding booze to barbecue sauce is certainly not a new or particularly original idea. We have reviewed a few different sauces in this series of reports that have had whiskey, or even beer among their ingredients. Obviously, a huge reason for the existence of these sauces is to leverage the brand name power of the alcoholic beverage. Jack Daniel's, Budweiser, etc, are mega-brands that many consumers already associate with partying and having a good time. So cross-branding with grilling/barbecue-related products makes good sense. But for our purposes, the question is: is it good? In my experience thus far, booze-branded barbecue sauces have been pretty disappointing. How will Maker's Mark stack up? 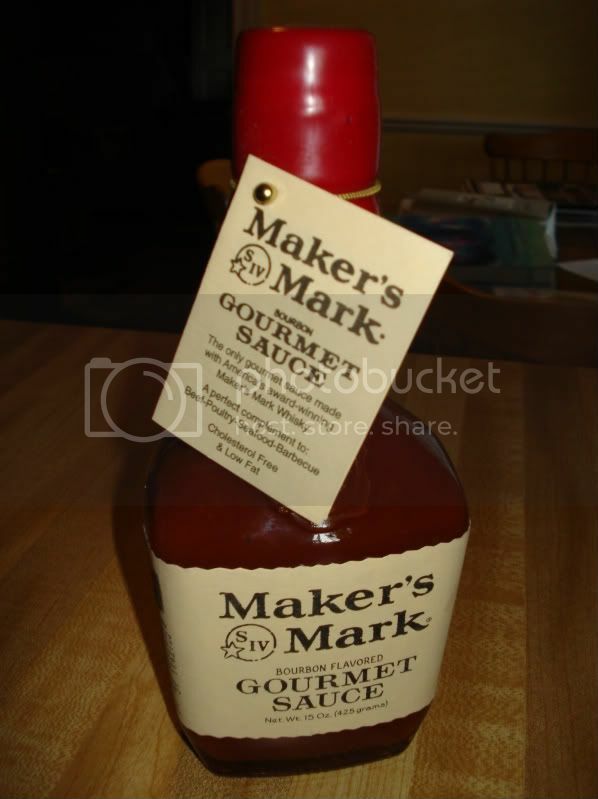 The folks at Marker's Mark claim that this sauce recipe was actually developed over 100 years ago by a Louisville area chef. You'll notice that the sauce is never actually referred to as a barbecue sauce, but rather a "gourmet sauce." In fairness, it does boast some unique ingredients - pineapple, applesauce, raisins, eschallots, etc. The sauce's color is typical of a tomato-based barbecue sauce, and is on the thicker side, in terms of viscosity. The mouthfeel is mostly smooth, with some tiny little bits to provide textural variety. The thing that is immediately (and unexpectedly) noticeable is that this sauce is more savory than sweet. The tomato flavor yields more tanginess than sweetness, and there are notes of celery and lemon. The bourbon flavor is very subtle, complementing the slightly peppery finish. The overall flavor of this sauce is interestingly reminiscent of a Bloody Mary. It has very delicate flavors that would be a nice complement to many different kinds of protein. Hey hunters, are you tried of that flavorless game bird? Are you constantly looking for new marinating techniques? Do you have a broken tooth from biting down on that shotgun pellet? I may have found the answer. Season Shot is a flavor packed shotgun shell. Why wait to season your meat when you can season on impact? Just shoot the game and throw it in the oven. Don't worry about the shot, because the pellets will just melt down. You might want to even shoot the thing twice to get some extra flavor. Check out other strange food products here. I've been going to Panic shows for over 10 years, and this is one of the coolest things that I have ever seen them do.